Raumfahrt+Astronomie-Blog von CENAP - Blog: Astronomie - NASA’s shrinking window for a mission to Triton This little mission with big returns would give scientists a closer look at a moon that may host an environment hospitable for life. 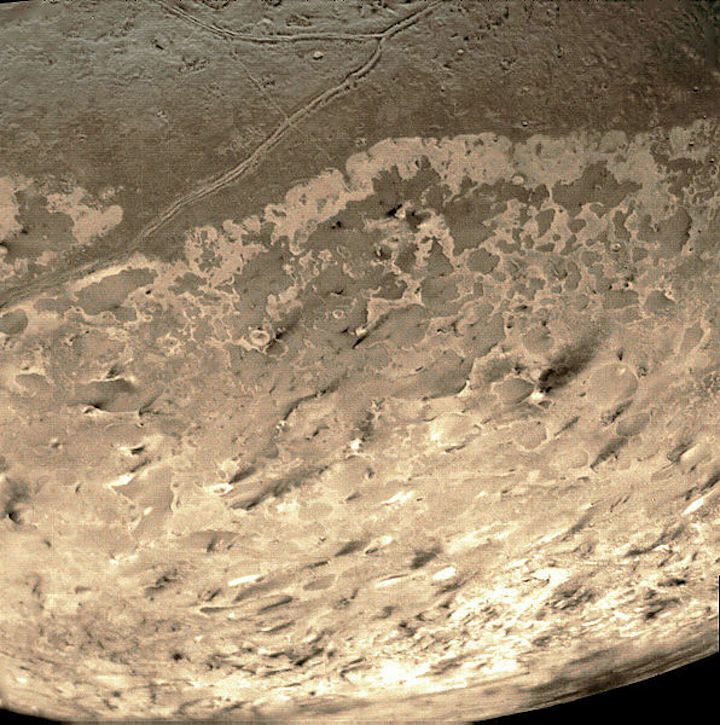 When NASA’s Voyager 2 spacecraft visited Neptune’s largest moon, Triton, it returned images of a strange, icy surface terrain pockmarked by geysers. Decades later, astronomers are now eager for a closer look and have proposed a mission they call Trident. 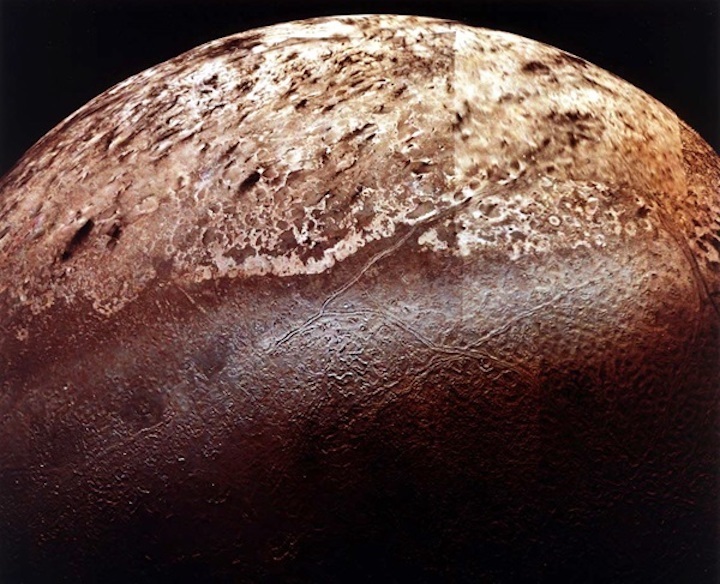 The last and only time astronomers got a close look at Neptune’s moon Triton was in 1989, when Voyager 2 sped by, taking images of just one side of the moon. But that brief encounter revealed plumes of material shooting out from a world so distant and cold that any activity was immediately fascinating. Scientists now think the moon has an underground ocean. This makes it a prime target for finding potential alien life in a frozen zone of the solar system well outside the standard Goldilocks (“not too hot and not too cold”) region. Scientists want to go back to get a better look. Prockter’s team is proposing the mission under NASA’s Discovery program for low-cost missions. But competition will be steep. Other proposed missions including exploring Venus or returning samples from Mars. And even if Trident is eventually selected, the development timeline means a launch wouldn’t happen until 2026, just in time for an arrival at Triton in 2038. One of the prime mission goals is to understand the plumes Voyager spotted three decades ago. Mars and comets sometimes puff out material when the sun heats their surfaces, causing small explosions of warmed gases and materials. The volcanically active Jovian moon Io also spouts off material. But Triton’s plumes are more likely to imitate the icy moons Europa and Enceladus, and possibly be spouting material from its ocean interior. 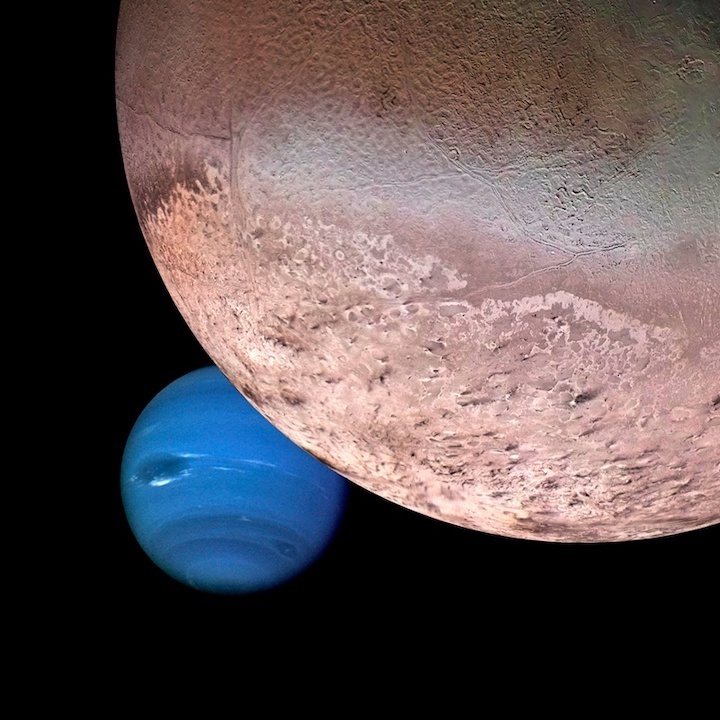 Triton, Neptune’s largest moon, has only been visited once, three decades ago. Prockter and her team aren’t the only ones interested in the ice giants and their moons. Another group of astronomers has already proposed a much larger mission to target both Uranus and Neptune, with time to explore their moons as well. But that mission, despite being aligned the NASA’s decadal surveyinterests, is still a long shot. And Prockter points out they’re not in conflict. “[Trident] could be a pathfinder for a future flagship mission.” It could also be incorporated into such a future large mission. But Prockter also says there are reasons to go now, without waiting for a bigger, more ambitious mission. Last time, the nitrogen-rich plumes occurred in Neptune’s southern hemisphere during summer, when the sun illuminated that area, possibly heating it and contributing to the activity. “We want to see those areas that Voyager saw, so we have to go before 2040,” Prockter says. After that, the sun will move north, and scientists will lose their best chance at repeating Voyager’s lucky observations. A 2026 launch also allows them a more or less straight shot out, with only a small gravity assist from Jupiter along the way. Since Triton’s seasonal cycle takes 80-plus years, such an opportunity won’t come back again for quite a while. While New Horizons made an even longer journey to Pluto in nine years, it was a more ambitious mission, launched on a larger rocket. In order to meet Discovery-level costs, Trident would launch on a smaller vehicle at a more sedate speed. It would need all 12 years to get to Neptune’s orbit. But it will also be a smaller craft. Triton’s geysers and cantaloupe terrain make it a prime target for finding life in our solar system. Trident won’t need the broad solar arrays that many space missions use. Instead, it will use a radioisotope thermoelectric generator, or RTG, which taps nuclear decay for power and heating. While such nuclear-powered batteries were broadly used in older missions, NASA now faces a shortage of the plutonium necessary to fuel RTGs. But two of them are up for grabs in the Discovery program, and Trident, traveling to the solar system’s dark and distant edges, would be a prime candidate for this BYO energy solution. In addition to a smaller launch vehicle, part of the mission’s low cost will come from recycling equipment developed for other missions. “There are no miracles. We’re not doing anything fancy,” Prockter says. Instead, they’ll borrow from missions like JUICE(the JUpiter ICy moons Explorer), cobbling together a suite of instruments to essentially create a mission from off-the-rack components, instead of designing them from scratch. Their design would produce a narrow angle camera that works like a telescope, so NASA could image the moon from a distance on approach and departure. It would also include a wide-angle camera that can see in low light for the flyby itself, to more carefully image the surface. They’ll have a spectrometer to study the composition of the moon and any plumes they spot. And Trident will also sport a magnetometer, an instrument the Galileo spacecraft used to detect underground oceans on Jupiter’s icy moons.